Round, oval, slit-shaped... 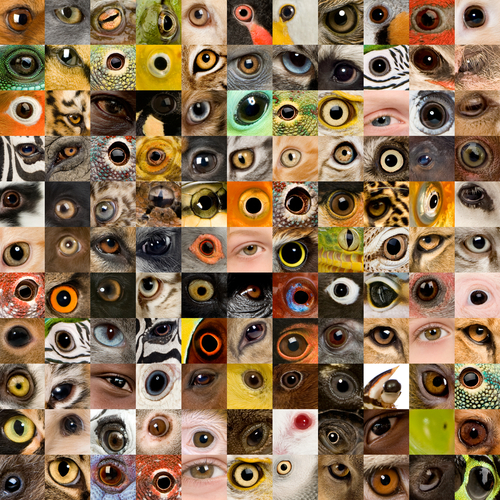 Animals have pupils of many sizes and shapes. Why the difference? What makes one type of pupil more favorable than another? The pupil is an adjustable aperture which helps the brain cut down or increase the amount of light entering the retina allowing us to get a more defined image. As you can see in the illustration there is quite the variety. All of these different sizes and shapes do serve a purpose for the respected animal that they belong to. Whether that animal may be nocturnal,diurnal, hunter, prey or environmentally specialized (such as underwater). You may know someone who has two different sized pupils. What is going on there? The best answer is that it depends on the individual situation. Approximately 20% of the population has a small difference between the two pupil sizes which is normal for them. There are also some medical conditions which can cause pupils to react differently to light. Additionally, trauma to one eye can cause the pupil to react differently compared to the other eye, and some eye surgeries can cause a pupil to be changed. As it pertains to eye exams at Milwaukee Eye Care Associates, the doctor or technician will evaluate the pupils to ensure that they are "PERRLA" which means the Pupils are Equal, Round, Reactive to Light and Accommodation and will investigate to find the cause if they are not!